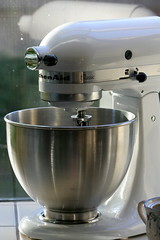 One of the best baking-related purchases my wife and I ever made was this KitchenAid stand mixer, currently available at the lowest price I've seen it from Amazon.com. Cookie dough, cake batters, meringue, and whipped cream mix up quickly and effortlessly, and you can gather ingredients for the next step of the recipe while you wait. (Compare to the hand mixer version of this story, where your arm muscles start to cramp around the fifth minute of waiting for soft peaks to form.) If you've been thinking about snapping one of these up, now may be the time. One caveat is that if you tend to make double recipes or breads with stiff dough, you may prefer the larger, more powerful, and more expensive model. Photo by flickr user John-Morgan.